As a life-long Florida resident (for better and worse), I can personally attest to a tangible shift in weather patterns over the years. Whether it’s the manifestation of man-made global warming, natural climate change or a combination thereof, the hot Sunshine State has gotten hotter. In the last five years particularly, the long, sweltering summers have gotten longer and the winters were reduced to literally one or two unnaturally cold days. Well, a newly published study confirms this and suggests that it’s these increasing lack of cold snaps over the last three decades that has contributed to a widespread expansion of mangrove forests across the northern section of the state. But, what exactly does this mean for the Florida ecosystem? The study conducted by ecologists at the Smithsonian Environmental Research Center in Maryland had its findings published December 30, 2013, in the journal Proceedings of the National Academy of Sciences and predicts that we’re only seeing the beginning. The growth wasn’t attributable to average temperature, sea level rise, rain or land use. Instead, the mangroves were sprouting up in areas that experienced fewer instances of the temperature dropping below 25 degrees Fahrenheit (minus 4 degrees Celsius). 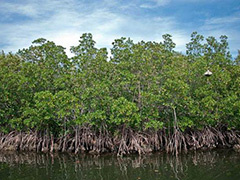 While mangroves do play vital roles in allowing other marine life to thrive, the rapid expansion could pose problems as global warming is expected to continue and increase. And, chances are that the mangroves will grow beyond the borders of Florida. Posted on January 6th under Global Warming Issues.